Morning Coffee & Afternoon Tea: Is it SKON or SKOAN? Is it SKON or SKOAN? I guess it depends on where you're from. Some pronounce it like "gone", some pronounce it like "groan". In any case, this is one of the most well-known foods served at afternoon tea. Personally, I like a scone for brekky with my morning coffee too, but that's not common here in the U.S. where most people go for a donut or a bagel. It's believed that the word and the food originated in Scotland. Not everybody agrees with that, however. Here's a little bit of the history of the scone, and some really delish recipes. This Scottish quick bread is said to have taken its name from the Stone of Destiny (or Scone), the place where Scottish kings were once crowned. The original triangular-shaped scone was made with oats and griddle-baked. Today's versions are more often flour-based and baked in the oven. They come in various shapes including triangles, rounds, squares and diamonds. A few miles up the river from Perth is the site of the historic Abbey of Scone, where the kings of Scotland were crowned. But the glory of Scone has long departed, for, even in the time of the writing of the old "Statistical Account"...."on the spot where our ancient kings were crowned there now grows a clump of trees." At Scone the Coronation Stone or Stone of Destiny was "reverently kept for the consecration of the kings of Alba" and, according to an old chronicler, "no king was ever wont to reign in Scotland unless he had first, on receiving the royal name, sat upon this stone at Scone, which by the kings of old had been appointed to the capital of Alba." The Stone of Destiny, now in Westminster Abbey (at the time this was written), is an oblong block of RED SANDSTONE, some 26 inches long by 16 inches broad, and 10 1/2 inches deep: on the flat top of the stone are the marks of chiselling. Some folx think the word "scone" has nothing at all to do with the Stone. 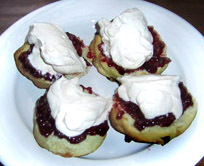 Some say "scone" came from the Gaelic word "sgoon" and rhymed with "gone". I can't seem to find any translation for the word sgoon, though. Is it a gaelic secret? Anybody? Others believe the name is derived from the Dutch word "schoonbrot" meaning fine white bread or from the German word "sconbrot" meaning 'fine or beautiful bread'. dry mix and gently shape dough into a ball. wedges and place on a baking sheet. Another favorite is the blueberry streusel scone shone in the photo here. You can find the complete recipe and instructions here. Glad I'm French! Gimme a doughnut, croissant,pastry or bagel any day. Heck Dorito's look good up against these things. Apparently, the Gaelic for scone is sgonn arain. Sgonn means block or big slice and arain means bread. I am looking for a recipe for sweet potato scones which I had recently and they were soooooo good!! Excellent article...and as enjoyable to read as it is to eat a scone and sip a cup of tea, coffee, or chocolate. All I hoped to learn was the history of scones, but I learned much more, and enjoyed every bite. Thank you! "Is it a gaelic secret? Anybody?" 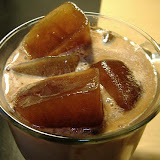 It is derived from the Gaelic word "SGON" which means "mass or large mouthful." The Gaelic word sgonn means "a shapeless mass or large mouthful" according to the Joy of Baking. try marion cunningham's recipe for cream scones in "the breakfast book." it's lovely and delicious. i add dried cherries, orange zest and some chopped up bittersweet chocolate. Interested to read your 'is it skon or skoan'. In Scotland it is 'skon', but Scone near Perth is pronounced 'skoon'! The Stone of Destiny has now been returned to Scotland and is now in Edinburgh Castle.